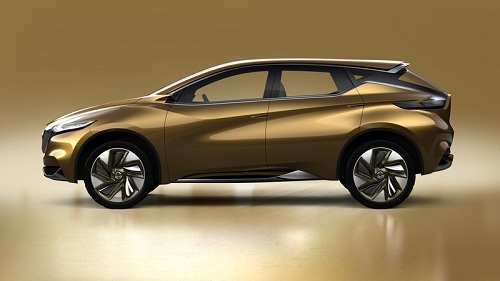 Introduced at the Detroit Auto Show, Resonance is a new Nissan crossover that may reveal the next Murano. Although Nissan never mentioned the Murano and the Resonance in the same sentence, this new crossover prototype from Nissan is very likely the design study for the company’s 5-passenger crossover vehicle. Just as Batman and Bruce Wayne are never shown standing side by side, Nissan is being careful not to confirm any new designs for the Murano. However, this new vehicle is the same size, has the same seating arrangement, and sort of looks like the Murano in the way Mary-Kate sort of looks like Ashley. The Nissan Resonance is a real looker. The design walk-through at the North American International Auto Show by Nissan Executive Vice President Andy Palmer was excellent. Palmer started at the front explaining new “V” shaped grill will be the new front end of Nissan. Good work Nissan. This is a look that is derivative of its present look, but also new and fresh. It also avoids the epic fail by Acura with the shield look that hammered down sales of otherwise great cars. Nissan and Lexus could not possibly go in more opposite directions with their new looks and that itself is fantastic since Lexus and Infiniti are very closely aligned in their product offerings. Dr. Palmer next directed our attention to the lights. The new boomerang shape is a great integration of the many small dots that are LED lights. Thank goodness we are now in generation two of these terrible, terrible inventions. Finally, designers are discovering ways to make these incredibly efficient and long lasting dots work in a front end design. Heading back towards the rear Dr. Palmer calls the wave design a “fluidic form.” Dr. Palmer was careful not say “fluidic sculpture” because that is Hyundai’s trademark for the design of its new Santa Fe crossover. At the rear, the “Kick-up” D-pillar looks great and is somewhat different than Murano’s now classic shape. If the Resonance’s interior is anything like what a production car will have this vehicle is going to be a smashing success. The blue 3-D style of the center console gauges is really amazing and makes one think of Avatar for some reason. In a good way. The roof of the Resonance is all glass. Although glass is creeping further back and forward in many crossovers, it is not really practical to use such a design given roof crush and side impact protection requirements. There has to be a cross member between the B-pillars to keep the costs reasonable and not passing the test is the kiss of death for any car maker, so look for changes on the production vehicle. Although Nissan did include a “one-motor, two-clutch” hybrid design in the Resonance package, let’s not jump for joy yet that “two-clutch” means “dual clutch transmission.” Rather it seems that Nissan is trying to give itself its own identity in light of Honda’s new dual motor hybrid system. In any case, it would seem that the Lexus RX450h is to soon have a rival. Look for updates on the Murano and new Resonance and their possible convergence here at Torque News.